Even though I have to cope with a dial-up line, and I don't have a clue what is happening in the world, I have to tell this fish story. We finally had time to go up to the back lakes. We had the daughter, a friend, the better half, and the dog (and me!). This lake is 2 portages, and a paddle through a bog that is so lovely, that it is one reason the whole place became a park. The dog goes wild, and runs on the bog. The girls walked over the squishy floating bog, as well. One has to be careful not to jump on the low spots, or you'll sink up to your neck! This bog has the most lovely pitcher plants and sundew. The lake wasn't the best fishing, mainly because the weather was so hot and sunny. I only got some babies, but all the girls each caught a big one. Naddy's friend was bringing in our fourth big fish, when it swam beside the huge snapping turtle that was stalking us. SNAP! I was pulling up a fish with this huge turtle head around the middle. We went for the better part of valour, snapped the line, and let the turtle have the fish! The fish were great on the bbq, and I've had my fill of bass for the season. It's still beautiful tonight, with a light breeze. It has been my general observation that if the infrastructure is collapsing under its own weight, then that city is going to take a big hit, come earthquake time. I had outlined this in Urban Seismic Risk, but it is not generally know that New York City, is at very high risk of damage and loss of life, if an earthquake would hit. In fact, New York is one of the very few cities where an earthquake scenario has been laid out (along with some cheesy movies!). The city area has had quite a few historical earthquakes, and is tied with Boston as the city most likely to crumble with a bit of shaking. The whole east coast is on a 'passive margin'. I think it's somewhat unfair that this bit of tectonics is the most unstudied zone ever. I mean who wants to do their research on something passive? No money, and no tenure! But, take away the rest of the world, then our passive margin is quite exciting. It used to be in the central hub of action, when the giant Gondwana broke up, possibly adding to the woes of dinosaurs when all that cold ocean water started to circulate. Since then our passive margins have been sinking for millions of years, brought down by the cold oceanic crust that wants to soon join its maker. This tug brings about some big earthquakes, notably the 1857 Charleston earthquake. So, nothing makes a city more unfit for an earthquake than crumbling infrastructure. All those nice 100 year old steampipes (that are doing a 'splendid job'), will do what old steampipes do. The brick brownstones don't have much of a chance. A lot of Manhattan is on solid rock, but there is a lot of filled swamp around (which will get amplifications of over 100 times). Of course, it's a battle of who gets it first! I'm rooting for Toronto, who hasn't even got an earthquake scenario! The innocent always get whacked. Once again poor OPG gets roasted for the wrong things. Although the secretive part is right, a tiny hole in the pressure relief duct is nothing, and could be postponed until the next planned outage. If people were that worried, they could just slap a bandaid on the outside. The whole vacuum building thing is just a superfluous safety feature, added to deal with a slight Candu problem: too much water! It seemed to be a Biblical thing that they had to deal with a giant Transformer Autobot ripping a major steam line in half. In that case, the vacuum building (a little bit of Outer Space), would open its valves and start its Mummy Returns act. The pressure relief duct connects this Giant Sucking Sound to the steam break. When this system is activated, any little holes will quickly be plugged up by the sucked-up seagulls! Needless to say, there is a snowball's chance in Heck, that this ridiculous system will ever be needed (or work! ), and the newer reactors don't have them. Working at OPG (especially Pickering!) is psychological torture, so I feel for the little guy that leaked this. They should open up the SCR system, so people can see how darn-tootin' long it is! This little thing has been blown out of proportion, but there are far worse things on that SCR list, especially in light of the recent Japan nuclear brouhaha. Now that the Japanese nuclear plants are shut down, and everything is quiet again, I veer away from controversy (once again), and do another long boring story. I have a lot of these, since over the years, I've had to put a lot of rowdy cousins to sleep at the cottage. Now, nobody comes anymore, because they are all working, and I'm left alone to fish. This is the story of the humble seismic wave; it is created, travels a lot, and then dies. There are lots of different seismic waves, and I've done a lot of demonstrations of Slinky Seismology, but for now we can think of it as being a plain old seismic wave. The seismic wave first appears when the earth is disturbed in some manner. It can be created simply by whacking the earth with a hammer, or the use of an explosion, but most seismic waves are created by earthquakes. Seismic waves can be extremely useful. When artificially created, they can show oil reservoirs, or deep underground geology. When a big seismic wave is created by a large earthquake, it starts on a magical journey, which helps the Science guys. They need a lot of help against a hostile world. Seismic waves travel in all directions from an earthquake. Every time they hit a layer in the earth, they split and reflect a little. Scientists record when the seismic waves finally emerge, with the use of an extensive network of seismometers. The other month, I talked extensively with a young lady scientist, on how the reflections of seismic waves were telling them about a very subtle feature of the earth's core. Seems there might be a thin orange rind around it, of lighter elements. For some reason, some people get very excited about that! Of course, Nature doesn't know about good and evil, and really doesn't give a poop about us puny humans, so seismic waves have a dark side. An earthquake can really jack up the magnitude (size) of the wave, and this can knock down buildings, when combined with other things. It's a little known fact that seismic waves can get only so powerful before they can't travel anymore. A bit like cranking up your amp until the speaker blows! In this case, an extremely powerful seismic wave starts cracking the rock, (or moving water), and all its energy gets sucked up. A good, travelling seismic wave can only carry stress at a very low level, well in the linear range for fractured rock (and that isn't much!). So, the average seismic wave in solid rock is the same as a tsunami in the deep ocean: not much, and is defined by a low PGV. What makes it nuke-crunching is when it runs along a fault (blind thrust is the worst), or it activates low velocity sediments. Much like jelly in a bowl, the whole thing shimmers and shakes like Santa Claus. We can then expect velocity amplifications of around 100 times. Sometimes there are standing waves, which crunch houses, and people can actually see them zooming along! People only have a chance to play with the nice seismic waves if they are on solid rock. There is no chance for damage, since the PGV is perhaps only below 10 cm/sec. Of course, there isn't that much solid rock in the world, so most people make the best of it. Sometimes they do really silly things and ignore seismic waves, so they get whacked. Others are more careful, and respect the humble seismic wave. I really want a new nuclear plant for Ontario, but it has to be done right (Fat Chance!). Everybody who has ever done a project knows that there is a technically clean reference design, which can be built on-time, on-budget, with a high margin against failure. But then you have to make all the stupid modifications, pushed by powerful interest groups. I find that small variations from the ref design has a non-linear effect, in terms of time, money, and chance of success. The easiest thing to deal with are superfluous frills, like the paint colour, or 'look and feel' for a computer project. The worst are fundamental changes, imposed by groups refusing this or that, or the fact you have to use some incompetent cousin to build it! For Ontario, the first thing we have to do is pick out the type of fuel: natural, 2% or 4%. This is on the critical path, since the enriched stuff is so difficult to get; we would have to start obtaining it from Iran immediately (just kidding!). I would go with a modern 4% design from the US. I could have gone with France, if they sell us the fuel, but they are more silent than Japan, and I don't trust them. Second, we need a site. We have to go with 2 twin reactors, because the bureaucracy involved with a 4 unit station is just too hopeless. Think of every small group in OPG resembling the whole company, a complete self-similar organization, with information hiding, politics, silence, the whole bag. Dual twins need space. We can't go for the existing Darlington site, because it is too small, and jammed up against the largest active quarry in the world. Think the Japanese have a problem because their nuclear plant is on a fault? We have to go to next-door Wesleyville, and mow down all the silly regulations on existing versus new nuclear sites. It's only a few kilometres away, kiddies! The site has to be laid down parallel to the shore, because all the dang power needs to be shipped out on high voltage lines. The infamous sideways design (on the Darlington site) never shows the wires! As well, we need a common water intake, and tunnel outflow (no cooling towers!). The plant can be built totally seismic-proof without a speck of ridiculous seismic analysis. Just make sure everything (even transformers!) are built on the solid rock. The physics of seismic waves (more on that later) ensures that the Peak Ground Velocity (PGV) cannot exceed damaging levels. This design can be built economically, and can actually run well. Most likely, the political people will say it's impossible, but I can't envision anything else working. I do know that continued Japanese-type silence will end in a 'Pickering restart type' muckup. I'm about the only nuclear seismic expert who talks. Everybody else works as a consultant and has to be quiet, in order to satisfy political bosses with money. The most exciting thing (recently) in the nuclear seismic business has been a thing called Experience Data. You won't find this on the Internet, but it's a lot of fun! Like fishing! Basically you start with the idea that all industrial plants are the same to an earthquake. There are transformers, barrels of waste, storage tanks, pipes, etc. Then, the seismic fishermen go around to all areas that have had earthquakes, and look at the industrial plants. They look for damage, and especially non-damage (which most people don't look for!). They compile tables (a lot of data! ), and determine what gets damaged the most, and what never gets damaged. This information has completely turned a lot of conventional seismic engineering on its head. There are many things that get damaged which the old engineers ignored (like Japan!). There are things that never get damaged, which engineers pour billions into (like pipes!). Old OPG is spending billions (more or less) in replacing feeder pipes which can absolutely never get damaged in an earthquake. It's all due to the old crap analysis which I'm sure the Japanese love (and OPG!). The Japanese had a lot of experience data from previous earthquakes. But like The Claptrap Society, they never talked about it, or participated, as long as they could keep quiet about it. As far as we knew, they never applied the findings to their own plants (quiet again!). In Experience Data, there is some really, really good information on seismic interaction. Of course I would never say 'never, never' because of Conrad Blackism Libel Chill (I'm just kidding everybody!). And so this brings us to our new nuclear plant in Ontario (and a very long post!). Are we applying the old crap or the new stuff? I'm not very hopeful, because so far, everything has been very politically correct, trying to keep everybody happy. There is no hope we can build a new nuclear plant, when we really need it to keep on my air conditioner in the Home. Here's how to bring it on-line in my lifetime. Forget all the PC crap. Just lay down the only design that can be built by 2014, and people can take it, all or nothing. Of course, I know the only thing that can be done in that time, and I'll save it for another post. Right now, they are jamming 4 reactors sideways, in a postage stamp lot, with damn cooling towers, that will cast a permanent ice fog on the 401 and kill everybody! Does anybody think this can be built? You certainly can't hide that! This starts to crack their cone of silence and it turns out that there was all sorts of damage. Although it's like pulling teeth, we have already learned that they may have exceeded their design basis, which would have been shown by their internal accelerometers. Intense world interest will force them to open up, since this really is the first nuclear plant to be hit hard by an earthquake. I hope the people at home learn from this, especially in regard to transformers and internal seismic instrumentation. You can ignore the real world for only so long, before it bites back! I'm only doing this news story because quakes and nuclear plants are my 'raisin eater'. Big earthquake in Japan causes lots of damage and a fire in a huge nuclear plant. Of course, as with any nuclear plant, we'll never hear the actual details. There's always this huge blanket thrown over operational stupidity. Just like the Pickering 'problems' with the backup power, and the time they released 10 million resin beads into the system. Do you ever hear what caused these things? Can you imagine something 'Beyond Dilbert'? But I'm not the one to kiss and tell. 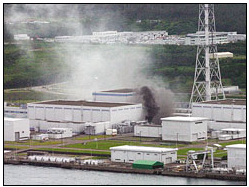 Still, I've seen nuclear plants that are tremendously susceptible to fires after earthquakes. Mostly electrical, with the big transformers which are the worst things in the world for earthquakes. The general tendency is to have a big whooshing fire dousing system that makes an awful mess, rather than doing something to correct the problem. I'm back from the darn cottage weekend. Oh well, I can always say it was a good work weekend, provided I could do things between the rain showers! Thank god for fast-drying outdoor latex paint! I'm recalling another major project which, although it wasn't an absolute total disaster, it wasn't quite what I expected. We still had money for geophysics, and we were flush from the success of our marine geophysics find. There were some areas on land that the marine surveys didn't cover, so we decided to go for a land seismic (vibroseis) survey. This was in cooperation with several government agencies, so our good 'industrial' money was well amplified. The details might be buried somewhere in Lithoprobe, but I can't find anything in my papers. We got a survey crew from Alberta with the giant vibroseis trucks (Dancing Elephants). These things are absolutely incredible, and when they start up sending a signal, you feel like you are in an earthquake! Now, for my favourite blogger, I will explain things in very simple terms. The big trucks have huge hydraulic pads which they place on the ground. They are all linked together, and then they vibrate the pads. Not just up and down, but with a very special little 'song'. Elephants do the same thing with their infrasound. This song penetrates down into the crust, perhaps up to 30 km deep, down to the Moho (where all crustal structure dissolves). On the way down, the seismic waves start reflecting from layers and bounce back to the top, where they are picked up by a very long string of microphones (geophones). The computers automagically correlate the frequencies of the song, and come up with the depth of the reflector, which is plotted as those ugly reflection plots I showed once. The nice thing about vibroseis is that we could run the surveys along roads without any trouble (or so we thought....). Turns out that Alberta roads were made for this in the first place, and they have huge compacted shoulders. Our country roads are crap! Also people are a big tetchy about having earthquakes generated near their houses! We were just helping them get ready for the big one! We had to pay a lot of damages, and I wasn't too happy about the results. Because the roads had a nasty habit of not going exactly straight over the important zones, we had to do a lot of dog-legs which messed up the results. As well, we got perfect reflections off the good rock, but nothing back from the bad rock (where the earthquakes were!). In the end, the results just confirmed what we saw in the marine section, and it wasn't until recently that I figured it all out. Still, it was a magnificent experience! It's still darn tootin' miserable at the cottage, so I'm writing some more. No wonder nobody is showing up anymore! I think with the high gas prices, and soon to be higher interest rates, the cottage frenzy will take a dip. This month they were asking a million bucks for a cottage with no road access! I've seen this before, when the property boom dies. But I love miserable weather, since it becomes so quiet here. When the kids were growing up, and we also had all the cousins, I used to tell long boring stories about science to put them asleep. Some of the kids really liked the stories and stayed up to the end, but instantly dropped off as soon as I finished. Over at Highly Alloco-blah-blah, he tells of his work with the most ancient rocks of all – the African craton. Up here in Canada, we also have these old rocks, and it reminds me of a nice long geology story, suitable for putting kids asleep! Over 4 billion years ago, the earth was forming. Lots of big ugly meteors were smashing into it, and it was mostly a big hot porridgey mess, with a methane atmosphere that would make Hamilton look good. Finally it started to cool, and the water could form seas. The heat kept bubbling out in the form of giant volcanoes and hotspots, but there was enough structure in place to start crystallizing out the scum. This was in the form of my favourite – silicon dioxide, and various other silicates. As an aside, if you are ever on the Atlantic coast, take a dark black rock, and a nice white rock of identical size, and heft them in your hands. You will find that the black rock is much denser (heavier), and thus lies the secret of all plate tectonics! The black rock is oceanic crust, and the white rock is formed of silicates. This scum gathered into lumps which formed the cores of the ancient continents. They slowly accumulated other lumps and grew. Now, the great mystery of plate tectonics, which nobody ever talks about, is that these lumps travelled all over the place and liked to clump together. 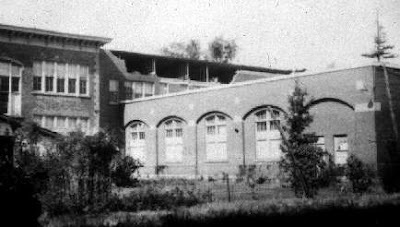 This was the start of the Wilson cycles. When they collided, great mountain ranges would form. Nobody talks about why they just didn't stay stuck together, but the new science of heat tectonics tells us that they just weren't thermally stable. Lucky for us, this rock fuzz never went back into the boiling porridge, unlike the much denser oceanic basalt (the black rock). But when all the scum gathered together into one big fuzz-ball, something marvellous happened. It acted as a giant insulating blanket, and the heat built up underneath. In a hundred million years, the heat had built up so much (with a lot of volcanoes! ), that the continents slid off the big expanded pimple of hot rock, and went out again. As they were doing the back and forth dance, more and more silicate got separated out and floated to the top, forming the continents we see today. As we speak, the Atlantic ocean grows wider, but lays the seeds for its own destruction. The oceanic crust next to Halifax gets colder, and one day it will start to sink into the soup. At that time, a subduction zone may form, and the continents will head back into the big lump. I'll be gone to the great fishing hole in the sky by then. I would think that if we are all to be roasted alive by Global Gorming, then the guy would be decent enough to throw in some nice hot cottage summers! Here it is, another cold rainy day in July, and no fishing! I've always been a rock lover. I guess it comes from the cottage. We have this steep vertical cliff, where the ravens like to have nests, and you can just tell that the rock is anchored down to the Moho. There's something about anchored rock. Most rock isn't truly connected to the earth, even the surface granite. When you put seismometers on it, you can tell that it is delaminated, somewhat detached. True solid rock has a feel to it. If I were to ascribe scientific terms (rather than mystical! ), I would think that it has something to do with the general noise field that we can feel with our eyes closed. Solid rock does not echo and resonate with a hollow sound. As well, the rock has thermal conductivity (no gaps) so you can feel that it is cooler with your facial infra-red sensors. The ancient Incas knew and revered 'true' rock. I was down in Peru, when I saw the most amazing Inca rock wall. Made of pure basalt, it was known to have no mortar, and perfect joints. I felt that I was up against true rock! Those guys knew what they were doing! I've seen a lot of crap rock! Those of us in rock mechanics wouldn't have a job without it. The most crappy rock I ever saw was up at the Bruce. We put a tunnel through it, and used (literally) trainloads of grout. Even that wasn't enough when we hit a giant cavern! We backed off the tunnel and cut a dogleg to go around it. It's a good thing that water intake tunnel never had to be waterproof! I did manage to get some fishing in from the dock. The dog gets so excited when I catch rock bass (considered a pest). I throw them on the dock, and she grabs them and takes up on the rock where they usually flop down into the water. Every time she spits them out in total disgust, but can't resist catching them when they flop. Maybe they'll leave the dock and quit eating up all the eggs of the large mouth bass. I'm leaving the controversial geology behind for now, since I hoisted that flag, and my fear of being shot is gone. (I mean, who cares if they put that stuff in a big pile of earthquake-prone gravel!). I'm recalling the first time I showed up to work, and how I just had to improve the computing there. They were still trundling up the stairs with a big box of IBM cards. I had to futz with them for a while! The first thing I did was get in a grand old Univac terminal, and good-bye cards! Then we discovered a modem and Compuserve. Boy, if they knew the stuff we did with that! I wasn't satisfied, so I was one of the first on the Internet, setting up a news-server on one of the first technical Sun workstations in Canada. I loved Sun then, before they gave up on us technical people. This was my main love, running Unix, but I was never smart enough to be a programmer, so I settled as a sysadmin. I had Netscape, and email for everybody, and then the wars came, along with my first depressive episode. The MS-bullies stomped on us like the vermin we were. They destroyed everything, and a couple of years later we got email again. All the smart programmers I knew left the company, but I stayed on, since I had a lot of earthquake stuff to do (one hand taketh, another hand giveth, etc). In case anybody was asking, I had a great weekend fishing. I caught some large bass on a very tiny hook, and they spit it out when I raised them. For those serious about fishing, never raise the fish out of the water, always slip a net underneath. I was asked to clarify my geology ramblings over the last few posts. I hesitate to do this because of the implications, but what the hey! I express this in the form of a Wikipedia article, but I could never submit this, since it contains original thought (a big no-no! ), and references which cannot be easily verified (behind the paywall). If this had been a real Wiki article, I would have extensively wikified it with links. There are two types of megathrusts in this world: a downward megathrust such as the big subduction zone near Vancouver, and an upward megathrust that is involved in mountain building. 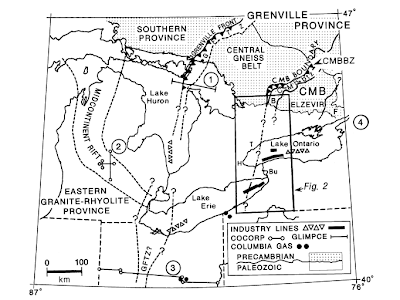 Before 1.1 billion years ago, most of southern Ontario did not exist. It was a big deep ocean, with a bottom of cold oceanic crust. At that time, the cold oceanic crust began to sink, and the ocean started to converge, creating many subduction zones. Much like modern-day Japan, these subduction zones created volcanic island arcs, but still the ocean converged, and continents were starting to collide, much like Indian and Asia. The first island arc complex collided with the cold core of North America (Archean). Huge megathrusts formed, creating a linear mountain range, as seen in the Rockies today. 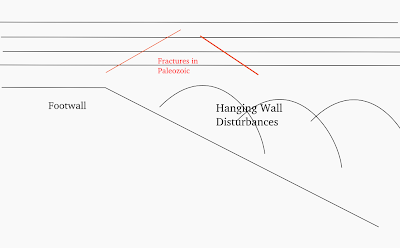 The heat and pressure, melded the rock together into a solid mass (metamorphism), and there was sufficient time before the next island arc collided, creating weak 'cold joints' between each episode. These cold-joint megathrusts are clearly visible in deep seismic reflection data. 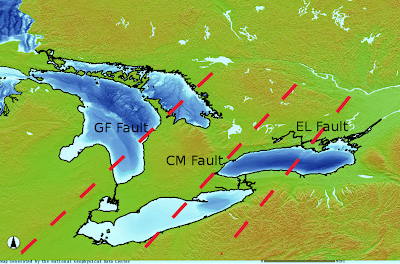 The leading one is the Grenville Front (GF) fault, the middle one is the Central Metasedimentary (CM) fault, and the third is the Elzevir (EL) fault. Note the perfect parallelism, as with most mountain ranges. Soon the oceanic convergence stopped, and the mountain ranges cooled down, eroded, and sunk. There may have been some backsliding collapse, which further weakened the main megathrusts. The basement rock was almost ground flat, but there remained very significant topography (Grand Canyon scale), at the megathrusts. Eventually, the basement rock cooled so much that it went below sea level. Shallow seas made extensive deposits, as the basement deflated. The sediments made flat layers for the most part, except over the megathrusts, where they had some difficulty. The continued sedimentation solidified the rock, but the rock over the weak megathrusts continued to fracture and slide, forming faults. At some point in the past, we Ontario residents were lucky that the deep Moho once again heated up, lifting Ontario into the position we now enjoy. This probably happened during the last mass convergence of the continents, just before the Atlantic separation. This uplift once again disturbed the megathrusts, and weakened the Paleozoic rock above. Of course, we cannot forget the last few million years of ice sheets, and damage they did to the already fractured rock. The basement rock sunk under the ice load, and is still uplifting in parts, but the general trend is for the rock to be sinking again over the last 50 million years. 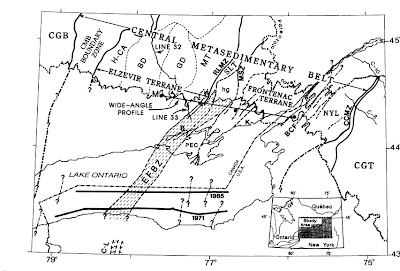 This can be seen on the available seismic sections, except for the GF fault, which only barely appears on the Lake Erie lines. The first map shows the maximum disturbance zones, which can be easily traced by long linears in shorelines, and rock topography. Along these lines lie most of our earthquake zones, oil and gas zones, and zones of smashed Palezoic rock. In between these lines are the the zones of solid rock, and high horizontal stresses. These fault zones have severe implications on the seismic hazard of nuclear facilities located on them, as well as deep geological waste repositories. More effort should be undertaken to properly map these megathrusts, mainly by processing the available seismic data in Lake Huron. The old fishing dock welcomes another worthy soul into retirement. This somewhat speculative headline has appeared: AECL Off to Scrapyard. (Poetic licence invoked). As someone who has worked with these guys all his natural working life, I take it upon myself to give them a nice roasted sendoff. AECL is one of my main inspirations for The Claptrap Society. As a pure government organization, they arose exploiting a technological niche which private industry was not addressing (like NASA), namely the Canadian requirement for a nuclear reactor that did not use a speck of enriched uranium. We all know Canada as the supplier of bomb material for the US, but that uranium had to be enriched in the States, and they didn't give any of that valuable stuff back to us! In the 50's, they developed nuclear power reactors that were just big steel cans where they popped in 4% enriched fuel, and let it boil. Absolute simplicity! We couldn't do that. AECL eventually developed the Rube Goldberg machine of reactors: the CANDU reactor. This had to have a huge core, and a zillion pressure tubes in which the wimpy fuel was loaded. It's a plumbers nightmare of feeder tubes, and other piping and valves. As well, the fuel wasn't worth much, so it needed continuous fueling with a giant machine that makes the rest of the reactor look cool. (It's all very safe, blah, blah). The need for AECL to join me on the dock comes from basic physics, in that this giant mess of a thing doesn't scale. They kept jacking up the internal flow rate on the pressure tubes, to finally arrive at the 1000 MW per reactor Darlington design, but they hit chaotic non-linearities. Darlington almost didn't start because of vibration problems, and they are still a problem (Did I say that out loud?). Needless to say, AECL was a fine opportunist, and the new design goes to 2% enriched fuel, which resets the scaling a bit. This is now quite close to the 'other' reactors that use 4%, but it is no longer very unique. AECL has had its day, and should retire quietly (like me!). They shouldn't really whine that they are a giant job creation project. That went out with the Soviet Union. Much like the beloved Arrow white elephant, and the big collapse of Nortel, the true talent is released to form the next Google, or something. I am really, really getting fish-deprived. I've got to update my fishing licence and actually catch something! I just had my formal-formal last day at the office, handed in my Blackberry, and all my badges. Since I am hereditary-depressive, I've got to watch these things and down some calmy-pills. That's why I won't get really involved in the mud-fest of the DGT (even though there's lots of money!). That's depressing!! Today we have a nice fishing story of the youngest of the 3 sisters of Ontario, the beautiful El. Like all her sisters, she started life as a fiery island arc, blasting away the primitive life, as well as giving vital nutrients. She was born in the proto-proto-Atlantic, but one day she woke up to see the looming ugly old continent before her. Just like a Toronto street racer and a concrete divider, she smashed up against the continent, and her life as a fun-loving island arc was over. Her weak remains were squeezed like toothpaste up into a giant mountain range. As with all things, she was ground down by time, covered by the poop of marine creatures, and fell out of all living memory. That is, until the intrepid bargain-basement seismic squad found proof of her existence under Lake Ontario. 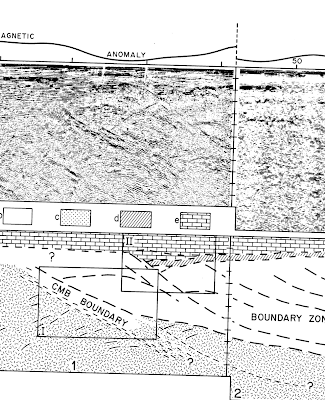 The paper is "Deep structure beneath Lake Ontario: crustal scale Grenville subdivision", and I don't know where the heck this one is hiding behind the paywall. There's El, called the ugly name of EFBZ in this figure. Naturally, El is much prettier in cross-section. Note the beautiful straight lines of her footwall, and the sensuous curves of her hanging wall! Even all mooshed up, El is a thing of beauty! Now the sad thing about El is that she never gets any credit. She mucks up the Paleozoic and caused earthquakes, just like her middle sister CM, but the limestone people say its all them! Down in the States, they blame big earthquakes on the Clarendon-Linden fault system, which is all kettle-scum! Poor El. Here is a seismic section showing what merry havoc she is wreaking on the flat-lying billiard tables. Lots of money available to get involved in the Deep Geological Thingie (DGT). Get in the slug-fest! Go up against lawyers! Wade through the tons of private-domain consultant reports! See if you can out sound-bite them! Try to figure out if the panel of old guys is really awake! Lots of fun for everyone! I didn't think they would do the money thing, but here it is. Let the games begin! As mentioned earlier in Seismic Fishing, we found the grand-daddy of all data fishing holes, in the tape vaults of Texas. 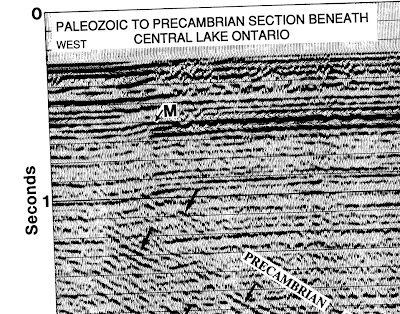 Besides nailing down the deep crustal structure of Ontario, we found the biggest fish of all: a giant Precambrian clastic basin right under Lake Erie! Lake Erie was always a weird lake for us. It's very shallow, and during a cold winter (which we don't get anymore! ), it can freeze right over. Once, we wanted to put in a giant underwater power cable to the States. We eventually found out that the winter ice smashes together like plate-tectonic subduction and forms giant pressure ridges, which can gouge huge trenches in the lake mud. That would mean the cable would have to be deeply buried (too expensive! ), even though all those natural gas well-heads also keep getting ripped out (but nobody talks about that!). As well, the cables would have to be DC, and we couldn't find conductive earth for a grounding mat in case of a cable break. Without good grounding, a DC cable fault would turn every cow in the region into instant hamburger! Enough old-man digression! It is generally assumed by the Paleozoic people (including oil and gas types), that the Precambrian granites (metamorphics), are flat-lying, featureless, and solid (like a rock!). The basement rock forms a solid plate for the pancake sedimentary layers, and has nothing to do with the location of oil, gas, and earthquakes. Our discovery shocked them, and they rushed to drill at the new targets. 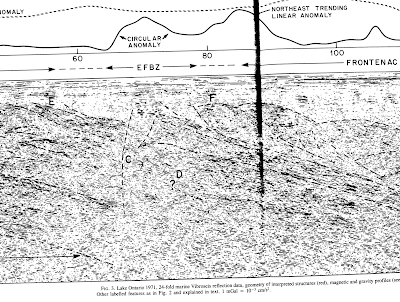 The paper for today is "Seismic images of a tectonic subdivision of the Grenville Orogen beneath Lakes Ontario and Erie". Available behind the paywall. This is the index map of the paper. We are only considering the little piece in the box, although there is a ton more data around the rest of the lakes. Note the tentative location of the other two sisters. The Grenville front is waaaay out in Lake Huron which will make the DGT panel happy. Sister #1 (Elzevir) conveniently stops at the limestones, but this paper shows that Sister #2 has a merry old time crashing right through! The section shows what a mess it makes of the Paleozoic. The box marked II is the basin, which is quite large! At least the oil companies knew it was a drilling target, they don't make the 'pancake' assumption. The paper goes on to recontruct how this could happen, mainly by having a giant mountain ranges, which then collapses under its own weight. I'm enjoying my post-work sabbatical. Unfortunately, I couldn't get to the dock this weekend because of teenager commitments, my daughter is off to Prague to represent Ontario in water polo! Yeah Ontario! One advantage of being old is that you have gathered a lot of old stuff that somehow is missed by the modern Google data vacuum. 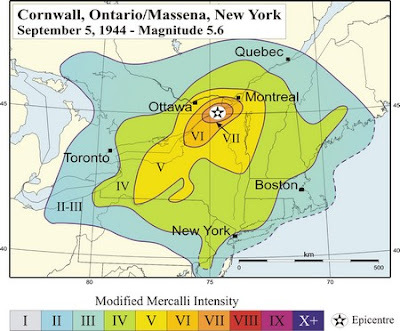 I have an obscure copy of "A geological study of the Massena-Cornwall earthquake of Sept. 5, 1944, and its bearing on the proposed St. Lawrence River project", by Charles P. Berkey, Geologist, New York, April 10, 1945. This was one of the more fascinating books of my career, when I first read it. My in-laws were living in Cornwall at that time, so I also talked to them about it. For emergency planning purposes, I considered this the perfect model for the likely Toronto earthquake (following the numbers!). It's magnitude is uncertain (especially on the countless magnitude scales! ), but is somewhere between 5.5 and 6.0. Again, nobody in soundbite-land will acknowledge the hazard, but we are as likely to experience this type of earthquake as most anywhere else in eastern North America (ENA). "The earthquake began with a violent shock accompanied by terrifying noises, including sounds and loud rumblings, at 12:38 am Sept. 5, 1944. This was followed by a second shock later in the same morning, with many aftershocks and tremors of minor character distributed through the following days." "According to these observers, the estimate of a million dollars damage for each of the larger villages, is probably not too high. It is made up almost entirely of small items affecting perhaps 90% of buildings in the town. ... practically every one of the 3081 homes and buildings was damaged, although only a few to a serious extent." Of course, all the damage was on the soft soils by the river, which consists mostly of the notorious Leda Clay. There were numerous liquefaction events. Up on the hard tills, the earthquake was hardly noticed (from my in-laws!). From my experience, I estimate that the Peak Ground Velocity (PGV) was about 500 mm/sec on the soft junk, and about 5 mm/sec on the hard tills and rock, an amplification factor of about 100 times. If we transpose this earthquake to modern Hamilton (the most likely location), we would probably get about 0.1 to 1 billion dollars in damage and economic disruption. I would suggest that the teeniest bit of special planning would reduce this by 10's of millions of dollars. The numbers show the odds at about 1% chance per year, so this gives a present value of about a million per year, which we should be spending.